Germany and Brazil committed themselves on Thursday (20 August) to a joint stance on climate change, putting the largest economies in Europe and Latin America on the same page ahead of global climate talks in Paris in December. 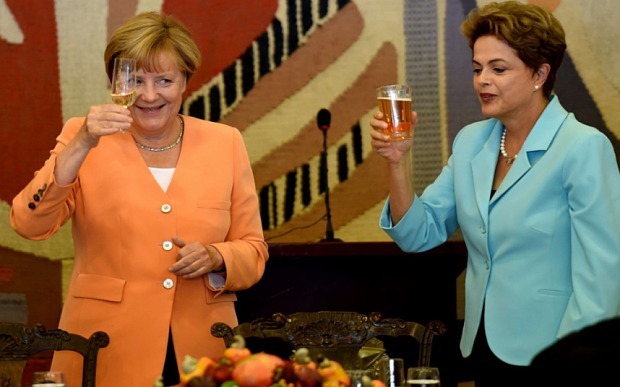 Chancellor Angela Merkel and Brazilian President Dilma Rousseff focused mainly on environmental cooperation during a 24-hour visit by the German leader that was also aimed at boosting trade and investment in Brazil’s stagnant economy. “We agreed on common actions to deal with one of the most important challenges of the 21st Century,” Rousseff said. She said Brazil is committed to reducing deforestation in the Amazon to zero by 2030. Rousseff declared Brazilian support for decarbonizing the global economy by the end of the century, an announcement environmental activists said would boost hopes for such a target being agreed to in Paris. According to Climate Action and Energy Commissioner Miguel Arias Cañete, Brazil is among the UN member states who have not submitted their Intended Nationally Determined Contributions (INDCs), in advance of December’s United Nations Climate Change conference. The COP21 meeting will seek a binding agreement on how to share the burden of capping global warming at 2 degrees Celsius (3.6 degrees F) above pre-industrial levels or lower. >>Read: How can developing countries make themselves heard at the UN Climate Change Conference? Putting money behind its commitment, the German government announced 550 million euros in financing for environmental and clean energy programs in Brazil. Germany’s Development Ministry will provide Brazil 525 million euros in loans to fund the development of renewable energy sources and to preserve tropical forests. Germany also donated 23 million euros to help Brazil establish a rural land registry aimed at enhanced monitoring of deforestation. The United Nations Climate Change Conference, COP21, will be held in Paris, France in 2015. This will be the 21st yearly session of the Conference of the Parties (COP 21) to the 1992 United Nations Framework Convention on Climate Change (UNFCCC). The go0al is to achieve a legally binding agreement on climate, from all the nations of the world. Corn fertilizer releases nitrous oxide (N2O), a greenhouse gas with nearly 300 times the heat-trapping power of carbon dioxide. US Corn Belt plus parts of China, Europe, and India which together make up a landmass of about 580 million acres / 235 million hectares (nearly six times the size of California), are the globe’s most potent sources of nitrous oxide.